Bipole III Project is a 1,384 km high voltage transmission line from a new converter staLon called Keewatinoow located near the proposed Conawapa Dam east of Gillam, ending at the new Riel Converter Station east of Winnipeg. The Bipole III Project cuts across much of the province, crossing a total of four Treaty Areas (1, 2, 4, and 5). Almost 3,000 towers will support the transmission line. Approximately 75% of generated hydro power from northern dams is delivered by Bipoles I and II in the Interlake. Controversy has surrounded Bipole III since the Manitoba government instructed Manitoba Hydro to build the transmission line on the west side of Lake Winnipeg, keeping it out of the boreal forests on the east side of the province. 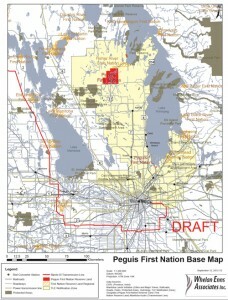 Will Bipole III Affect Peguis First Nation? The planned Bipole III route cuts across the traditional territory and Treaty Land Entitlement (TLE) notice area of Peguis First Nation. The Riel Converter station is located on the edge of Peguis’ TLE notice area. Impacts of Bipole III felt by Peguis members could include: contamination from a spill or fire at the Riel Converter Station, decreased populations of moose and other species, restrictions to hunting/ trapping/gathering, and potential impacts to cultural and heritage resources, including sacred sites. TLE selections, land access, and aboriginal rights may be affected. Approval Process – Where are we now? In December 2011 Manitoba Hydro submitted the Environmental Impact Statement (EIS) for the Bipole III project, to Manitoba Conservation. The EIS had a public review period until mid-.‐March 2012. Manitoba Hydro continues to file additional EIS information to fill gaps and incomplete sections. The Manitoba Clean Environment Commission (CEC) proceedings on Bipole III began in May 2012. CEC hearings for Bipole III are scheduled October 1 to November 22, 2012, with a final CEC report and recommendations due before the end of February 2013. Peguis First Nation is a registered participant and the public (including Peguis members) can make presentations during CEC proceedings. The Minister of Conservation and Water Stewardship will make a decision on whether to issue a license after the final CEC report. In February 2012 Peguis First Nation applied for funding from the Manitoba Aboriginal Consultation Fund to undertake our own Bipole III community project and EIS review. After months of waiting Peguis First Nation finally received funding from Manitoba in August 2012. A Bipole III community consultation coordinator will be hired, and Peguis will tell the government, in our own words, of potential impacts that Bipole III may have on Peguis First Nation’s territory, and rights. Two Community Meetings and two Round Table discussions regarding Bipole III were held in Peguis and Selkirk on October 24th and 26th, and November 27th and 29th. Attendance by community members was high at each event. Approximately 300 community members showed their concern and interest by attending the Bipole III community events regarding proposed transmission corridor. Many elders and land users attended. A survey regarding possible impacts from the Bipole III transmission project on Peguis lands, traditional activities, and rights has collected the concerns of Peguis members, and observations regarding impacts, accommodation of Peguis rights, and next steps regarding this and other Hydro projects. Two hundred Peguis members completed the survey. Primary concerns regarding Bipole III from community members include; impacts for those that depend on hunting and trapping; decreases for harvesters, gatherers of the medicines, the berries and plant; steps taken without notifying Peguis and consultation funds being too late in the process; Manitoba government consultation standards; reduction in both crown and private lands available for Peguis TLE; use of pesticides in the corridor and effects on the natural world; incomplete information about the new converter station. Peguis First Nation will be filing its report about Bipole III with the Manitoba government soon. The Crown will be informed of our nation’s position regarding Bipole III. The community consultation team wishes to thank everyone who attended, filled out the survey, and provided their knowledge to the project.